The Faroe Islands are the most spectacular place I’ve ever been. The landscape looks impossibly rugged, going from jagged mountains to churning sea in what seems like an impossibly short distance. The only sign that these islands are habitable are the winding roads and the small, colorful houses that seem to cling onto this craggy landscape for dear life. 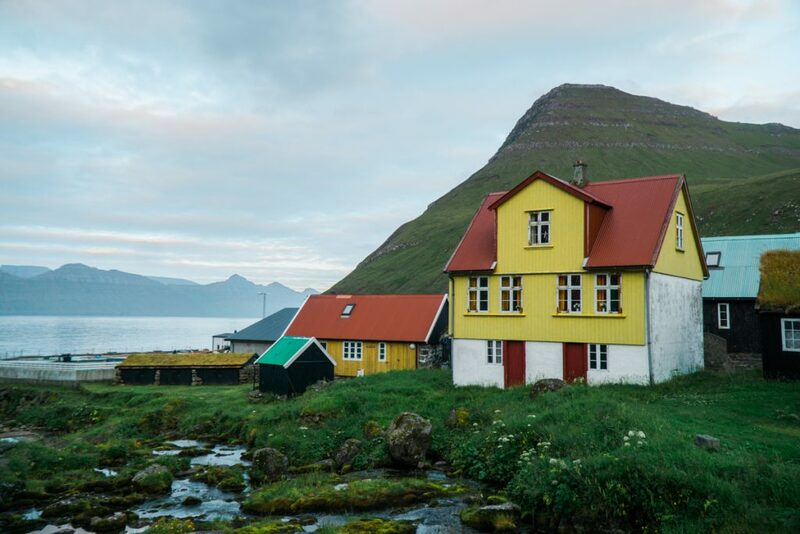 In this guide to where to stay in the Faroe Islands, I’ve worked my way from the nearest island to where you’ll land (Vágar) to the further reaches of the Faroes, culminating with the southernmost island (and one of my favorites), Suduroy. Far and away the island of Streymoy has the largest number of options, particularly in and around its capital city, Tórshavn. In fact, if you only want to base yourself in one place in the Faroes, Tórshavn would be my pick. 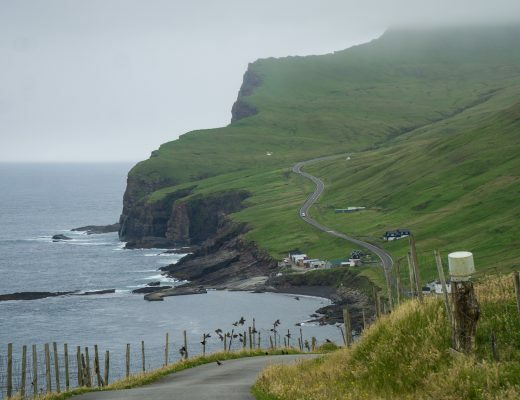 It’s relatively central – though to be fair, the Faroe Islands are so well-connected by road, tunnel, and ferry that no place is truly that far. 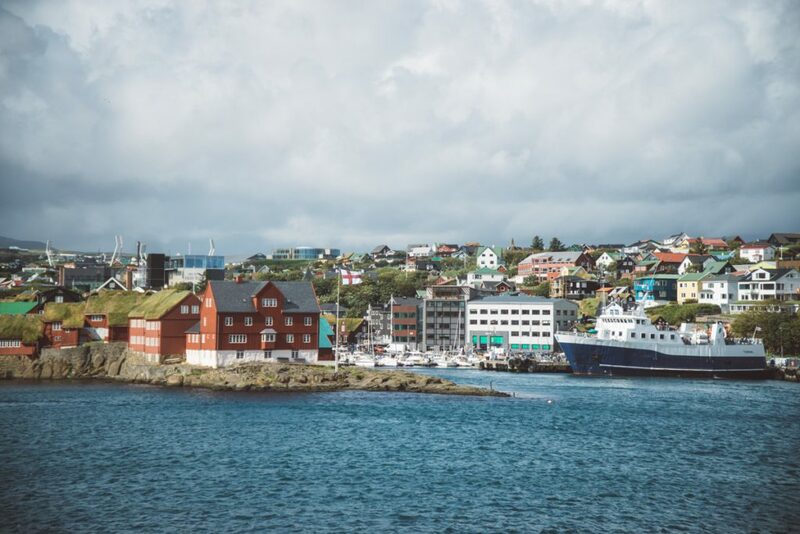 Tórshavn is easily connected by ferry to other lesser-visited islands like Nolsoy, Suduroy, and Sandoy, making it possible to get off the beaten path on day trips while staying in the capital. Want to save this post for future reference? Pin it to save! 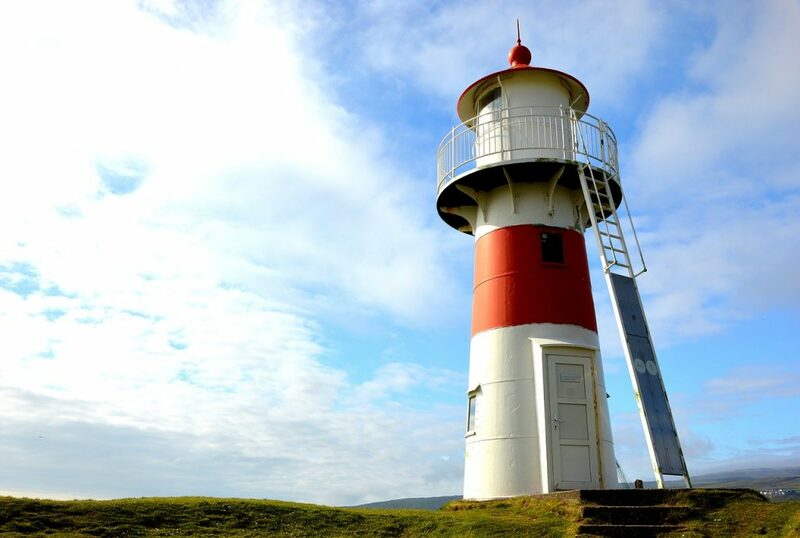 Suduroy, Nolsoy, and Sandoy are all easy day trips from Torshavn! Plus, if you’re planning on staying in hotels, Tórshavn is the place with the greatest variety of restaurants and nightlife (though to be fair, nightlife never gets that wild in Tórshavn). However, what I personally did on my Faroes itinerary was stay in a variety of places on three different islands, making it so that I had to backtrack less and got to spend more time off the beaten path in places like Bordoy and the northern islands and Suduroy, the furthest south of the Faroes. 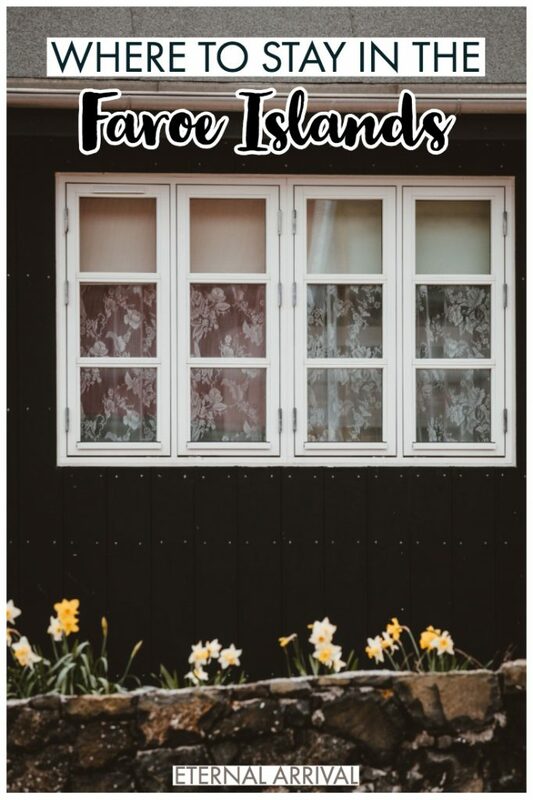 Depending on your travel style, you’ll want to either shack up in one spot or bounce around the islands, so I’ve included stops all around the Faroes to help you pick. Of all the places to stay in the Faroe Islands, Torshavn is the most convenient! $ – Budget: Has a hostel option. Each bunk should be less than $50 per person, or $100 for a private double room. 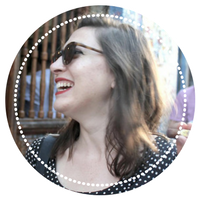 $$ – Mid-Range: No hostel option, and rooms cost between $100-200 per night for a double. $$$ – Luxury: Private rooms from $200 per night and up. If you’re arriving by plane, Vágar will be your first port of call in the Faroe Islands. 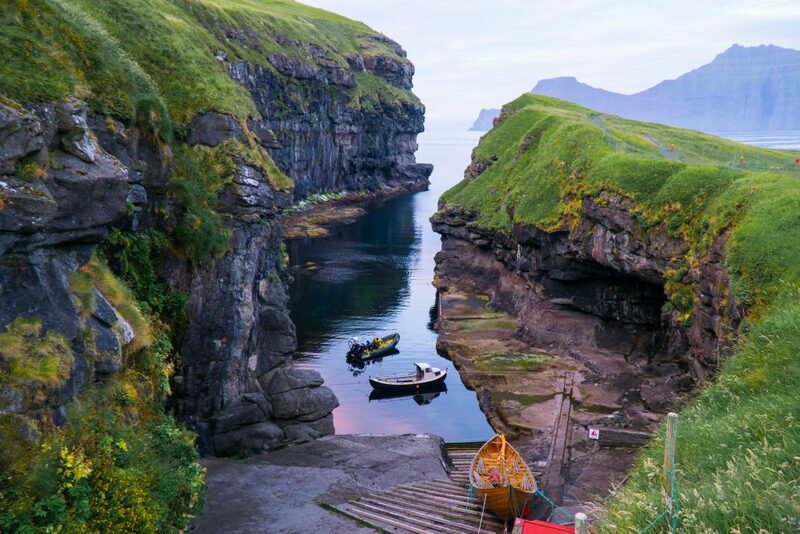 It is not a large island, but it does have a handful of the Faroes’ most famous and photogenic spots. Namely, you won’t want to miss Gásaladur and its famous Múlafossur waterfall which flows endlessly into the Atlantic Ocean from a height of 30 meters (nearly 100 feet). This was my first stop on my Faroes trip and as it’s only about a 10-minute drive from the airport, it’d be silly to skip it! Vágar is a great island for hikers, with two of the Islands’ best-known hikes both easily accessible. The Postman’s Hike from Bøur to Gásaladur is one of the most beautiful in the whole cluster of islands. The hike to Traelnipa, a.k.a. the “optical illusion” hike at Lake Sorvagsvatn, is one of the most spectacular hikes in the world. Close to the only airport in the Faroe Islands – not to mention the beautiful Mulafossur Waterfall and famous Traelnipa hike as well – this is one of the few Faroes accommodation options on the island of Vágar. With a view of the most famous sea stack in the Faroes, Drangarnir, literally right outside your window, The View more than deserves its name. Hosted by Tróndur and Anita, this is a relatively new holiday home option which they built from the ground up in 2017. However, they took pains to ensure their new cabins matched the beautiful landscape. That’s why they adhered to the old Faroese standard – a partial stone foundation, black painted walls, white window shutters, and of course, the turf roof. While the cabins look old-fashioned and traditional from the outside, on the inside they are delightfully spacious and modern. Each cabin has a large living room (36 square meters), a well-equipped kitchen so you can cook your own meals (and a dishwasher! ), a bathroom, a washer-dryer, and two bedrooms for sleeping in a cozy second-floor attic nook. Each of the four cabins can sleep four people comfortably. There aren’t a ton of hostel options in the Faroe Islands, but Giljanes Hostel is one of the few and it’s located in beautiful Vágur as well. 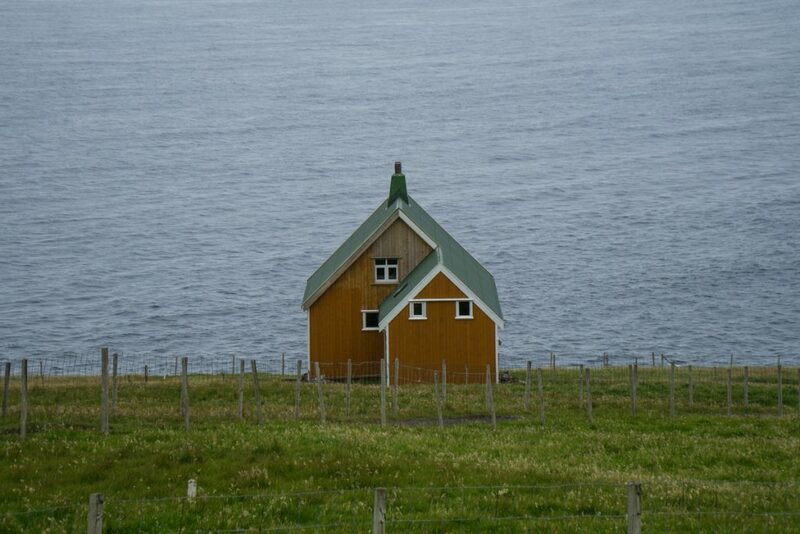 Most of the hostel options are on Streymoy, so if you want to stay in Vágur on a budget – whether it’s to take advantage of the beautiful hikes, catch an early ferry to Mykines, or be close to the airport – this is a great choice. This hostel has a shared kitchen area and a cozy lounge room as well, all of which are designed with a spacious, airy Nordic design in mind. 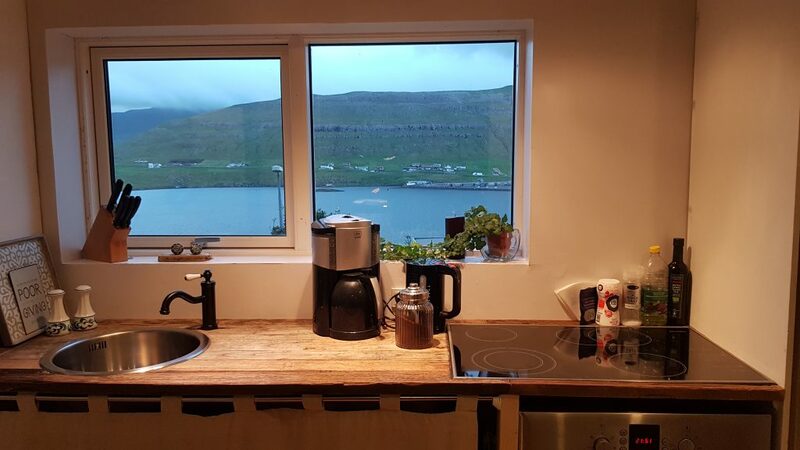 You’ll find the kitchen to be well-stocked and spacious, great for reducing costs while traveling in the Faroes as food costs can really add up here! It’s also near a bus stop on the line that goes from the airport to Tórshavn, so if you are trying to visit the Faroes without a car (difficult but possible!) it’s a great option as well. Some rooms even have a stunning ocean view, so try to find a room with that if you at all can! There are a few single and double rooms but this is mostly a hostel. 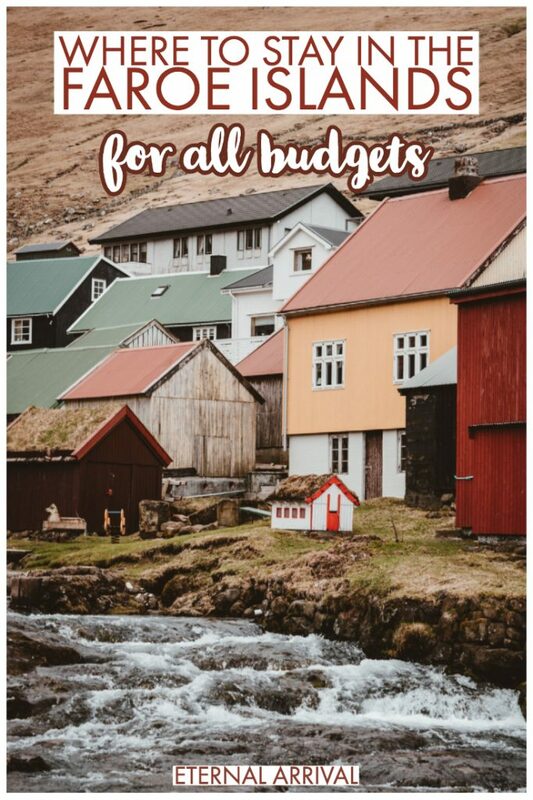 A variety of dorm configurations, co-ed and gender-segregated, are available, but so are tents if you are really on a budget during your time in the Faroe Islands! Wild camping is not permitted in the islands so this is a great and legal alternative, especially if you don’t have your own tent with you but feel like camping could be fun. 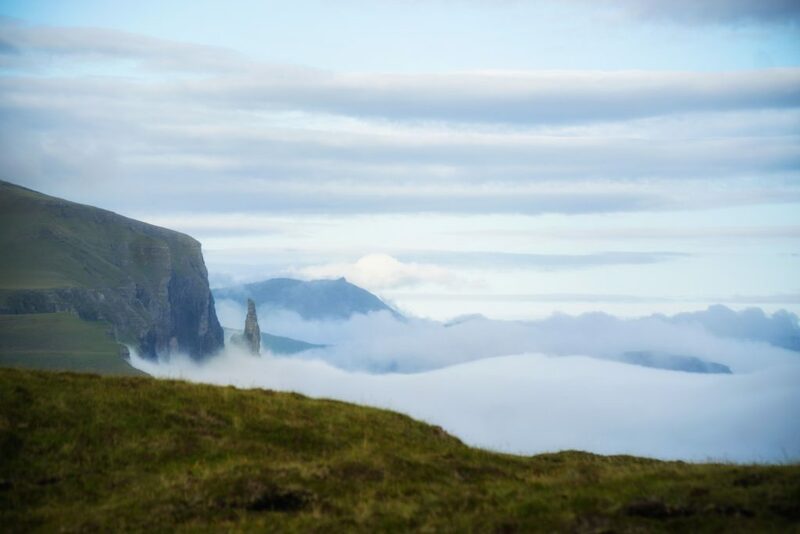 Previous guests have raved about the friendly host, the convenient location close to some of the Faroes’ best hikes, and how well-equipped the hostel is for the price. Literally a five-minute walk from the airport, Hotel Vágar is the place to stay if you want to be close to the airport for your flight early in the morning or if you have a late arrival and just want to crash when you get to the Faroes. There are only a few flights a day in and out of the airport, so guests have reported that they didn’t have a problem with the noise. Honestly, it’s not the most exciting place to stay in the Faroe Islands, but for certain cases it is definitely the most convenient. The rooms are bright, clean, and spacious, with wooden floors and TVs in every room. All rooms come with their own private bathroom, and some are ‘suite’-syle with a separate area for sitting and spreading out. Conveniently, there is also a restaurant at the hotel, which serves both international and traditional Faroese dishes on an à la carte basis. Free breakfast is included. Double rooms and family rooms (sleeping 4) are available. Streymoy is the largest of all the 18 Faroe Islands and home to the capital city, Tórshavn. Like I said before, if you want to only pick only one place to stay in the Faroe Islands, I recommend Tórshavn. It not only has the most Faroes accommodations options, it’s one of the places you can really get to meet local people and see what the average life of a Faroese person is like… after all, nearly half of all Faroese live in the capital. However, that’s not to say Tórshavn is built up or crowded at all. It’s funny that the capital city of this country is literally a third of the size of the California suburb that I grew up in – one that I always thought of as “tiny.” But when you compare Tórshavn to the rest of the Faroe Islands, full of sleepy seaside villages, you’ll see what I mean when I say that it is a completely different experience than the rest of the Faroes. One of the best-loved accommodations in the Faroe Islands, Hotel Føroyar has a fantastic location. 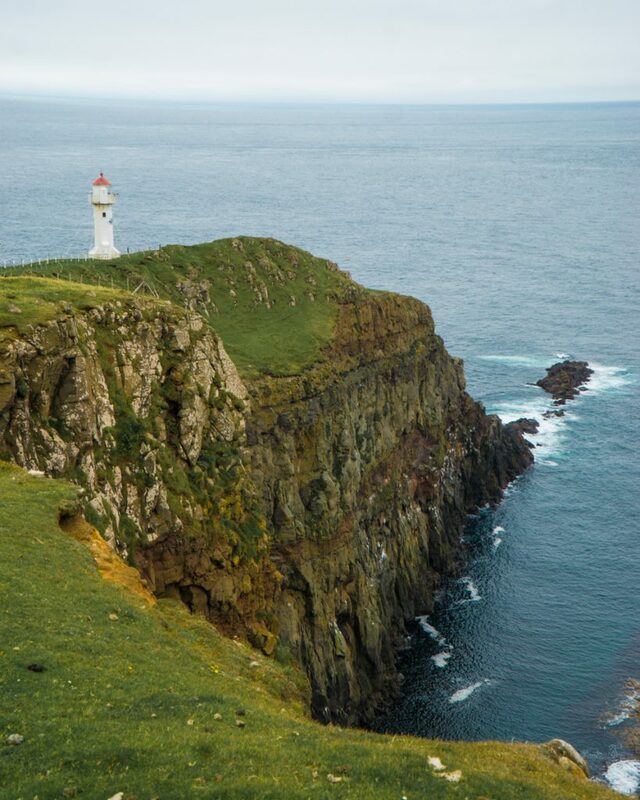 It’s not that far from the center of Tórshavn but it offers solitude away from the bustle of downtown, with panoramic views of the Nólsoy fjord, city, and gorgeous mountains. Meanwhile, amidst all the natural beauty, the hotel’s aesthetic is ultra-modern yet comfortable, with spacious rooms and interesting lounge areas. Every square inch of this design hotel is planned to please the senses. It was designed by the famous Danish architects, Friis & Moltke and the interior was designed by famed designers Philippe Starck and Montana. 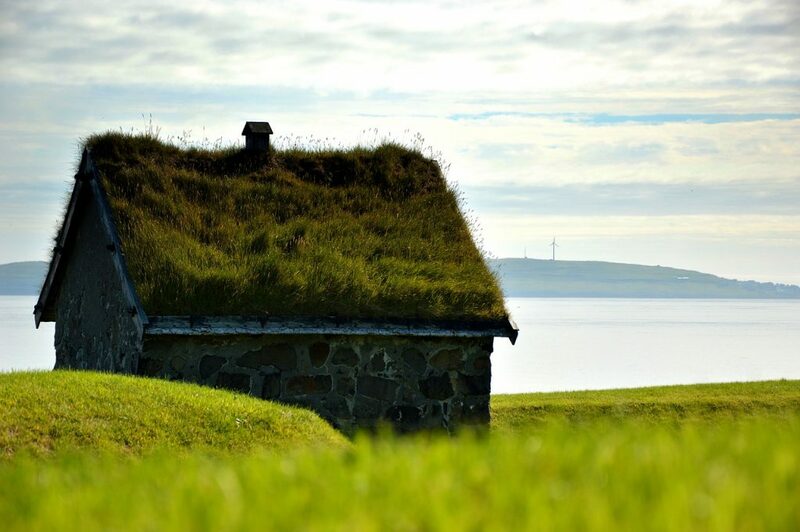 I especially love the traditional grass roof, which is just so quintessentially Faroese. Keep in mind that this location isn’t close to the center of Tórshavn, so if you are reliant on public transportation during your stay in the Faroes it may not be the best option. You can walk to and from town but it’ll take about 30 minutes each way, with the way back from town being uphill and very steep. However, I think it’s a great place to stay if you are renting a car and don’t want to deal with the hassles of parking in Tórshavn but want to be close to the action of the city. I stayed in the city center of Tórshavn last time and got really lucky to snag the last parking space at my hotel, but if I had to find city parking I would have been screwed. There is no kitchen access, but you can eat delicious traditional Faroese food at their well-known restaurant, Gras, if you don’t feel like going downtown to eat at one of the restaurants in Tórshavn. It also serves international food if you’re in the mood for something more familiar. There are a variety of rooms ranging from your standard double room to a business suite to a family room, making it one of the more versatile Faroes accommodations options. All are spacious and designed with aesthetics in mind, with luxe bathrooms that include a bathtub – perfect for soothing sore muscles after a long hike. Check out Hotel Foroyar’s reviews, photos, availability, and prices here! Views leaving Torshavn on the ferry! 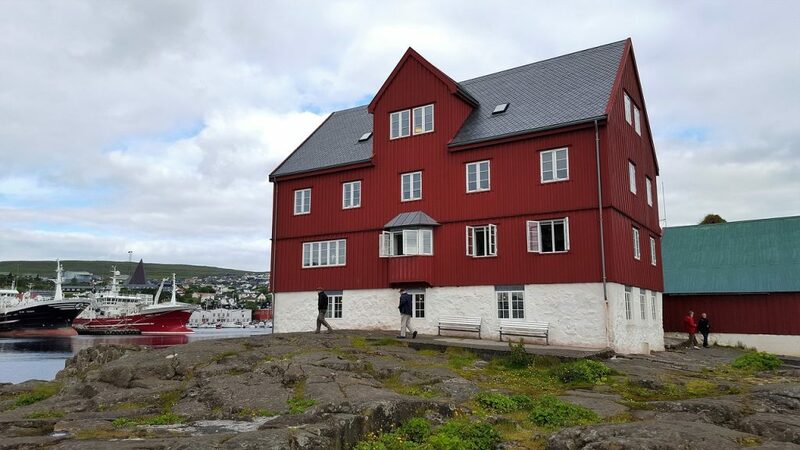 If you want a modern and stylish place to stay in Tórshavn just an easy walk from the center of town, visitHOMES Torshavn rooms is a good option. It’s full of stylish and new appliances and furniture; however, you sacrifice a bit of space and privacy, as it’s more like a bedroom in a house rather than a true hotel. If you enjoy meeting other travelers, however, this is more a blessing than a curse. There is a shared kitchen and dining room that you can use, which is great for reducing your costs in the pricy Faroe Islands – though that said, these rooms aren’t exactly cheap. However, there are a few quirks worth mentioning so you won’t be disappointed. For one, the bathroom is located separately from the room and down the hall in many instances. While there are convenient sockets located near the bed, there are no side or end tables, which would be helpful for organizing your stuff, as the rooms are on the smaller side. There is a continental breakfast available, but it does not come included in the room price, so keep that in mind. Another view of the lovely Torshavn harbor! This cozy guesthouse, Faroe City View B&B, has a shared lounge and fully-equipped kitchen area that guests can use, which can be very useful for reducing dining costs in the Faroe Islands. The décor is not super modern, but it’s functional, spacious, and on the affordable side of the mid-range budget spectrum with most rooms hovering just over 100 euros per night. Rooms are cozy, spacious, and well-decorated yet streamlined, with space for your luggage so you can spread out a bit. Guests have raved about the cleanliness of the rooms, the delicious free breakfast (not always a given in the Faroes!) and the relatively cheap price for Tórshavn. Keep in mind that this is a B&B, and all the rooms have a shared bathroom. This is one of the reasons why the price is low so if you can accept this quirk it’s a great choice. When it comes to Tórshavn, the location is hard to beat: walking distance to the center, though with a bus stop right near the apartment so that you can take the (free!) city bus whenever you please. Supermarkets and restaurants are 700 meters away. This is a great choice for people looking for a budget-friendly place to stay, but not necessarily wanting to stay in a hostel or to camp. 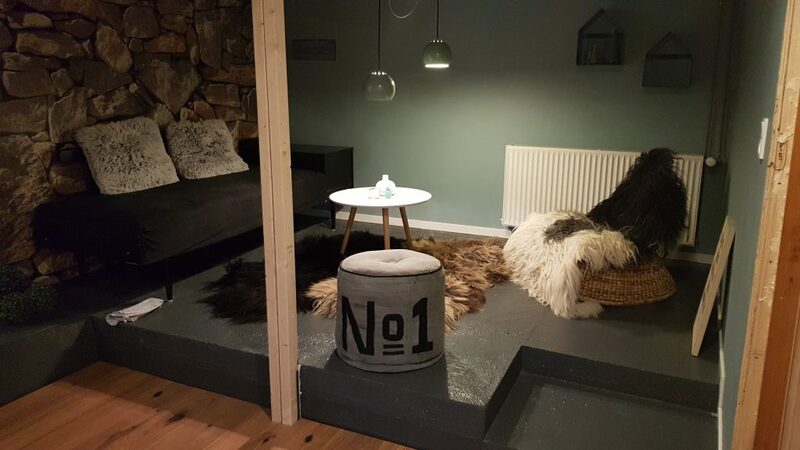 Offering both double rooms and single rooms for a relatively affordable price, 62N Hotel is one of the most popular choices for where to stay in the Faroe Islands and is often sold out months in advance. It’s mostly because of its excellent location, close to Tórshavn’s restaurants, bars, and shops yet with plenty of parking nearby. It’s a short walk to the harbor and Tinganes, one of the most scenic areas in all of Tórshavn (a high distinction). Guests have access to a shared kitchen, which is great for a hotel-style accommodation in Torshavn like this one as most hotels don’t have this choice and this can lower the daily cost of visiting the Faroe Islands by quite a bit. Rooms are modern and stylish, slightly on the small side but well-equipped with a working desk as well as a private bathroom in each room. Some of the rooms even have a private balcony with a sea view! Guests rave about its speedy WiFi, its excellent location, and plentiful breakfast; the attached restaurant gets lesser reviews, so skip it and opt to cook in or eat out at one of the delicious restaurants in downtown Tórshavn (we loved Circus and Paname Café). One of the most unique places to stay in Tórshavn, Havgrim Seaside Hotel 1948 is absolutely stunning. 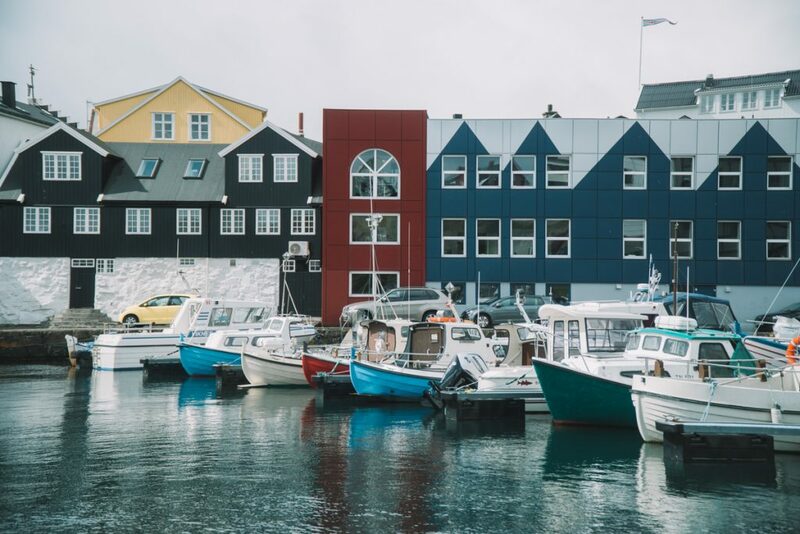 It’s quite close to the city yet far enough away from the hustle and bustle to provide free parking for its guests, perched high enough up to offer incredible views over Tórshavn’s harbor and the nearby island of Nolsoy. Guests rave about the kindness of the staff and the deliciousness of breakfast, which is included in the room price. The breakfast room is lovely, with plenty of plants and cute furniture to give you the feeling that you’re eating in a dear friend’s kitchen, rather than a big hotel’s faceless dining room. The whole hotel has that same vibe to it, a place with true personality, unique down to every last detail. It’s on the less expensive side of the luxury tier as well, so it’s a rather good deal for the Faroe Islands. The rooms are very luxurious and beautifully designed, with fluffy white linens, brightly-lit with large windows (with heavy curtains to block out the sun in the summer), and thoughtful details like reading lights, coffee & tea making facilities in the room, and L’Occitane toiletries. It’s inclusive as well: some of the rooms are specifically designated as accessible, great for travelers who have limited mobility or use a wheelchair. Check out Havgrim Seaside Hotel’s reviews, photos, prices and availability here! 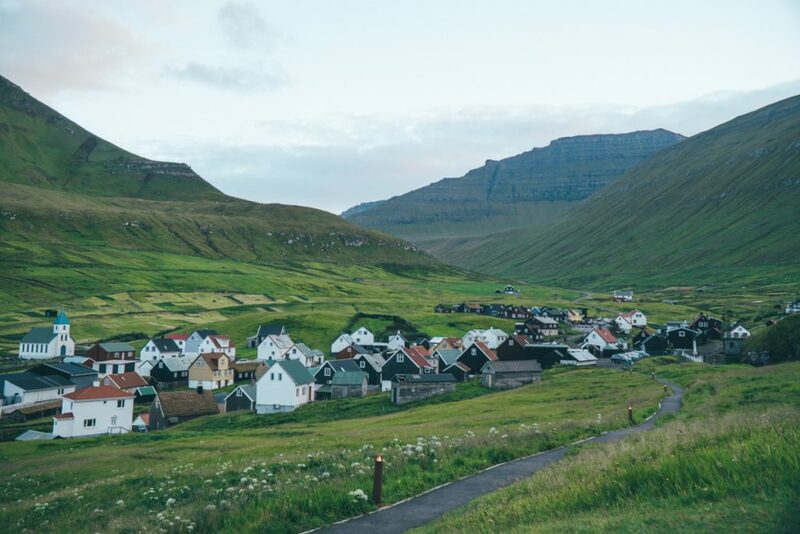 If you want to stay in a traditional house with a turf roof, surrounded by one of the most beautiful environments in a quaint seaside village in the Faroes – this is your pick! 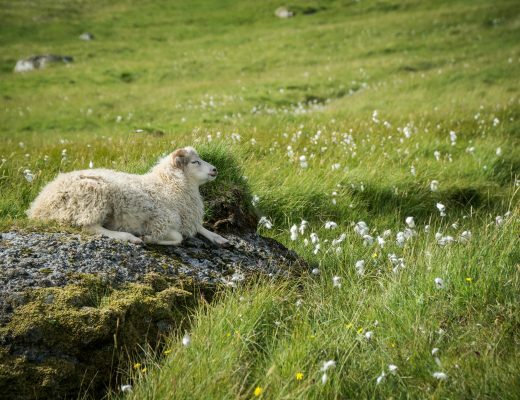 There’s no kitchen access, but breakfast is included and the guesthouse also provides lunch and dinner for an additional charge in the on-site restaurant, which serves up typical Faroese cuisine. Each room has a private bathroom with a shower, with clean and crisp linens, closet space, a desk area to work at if needed, and daily maid service. Some rooms are located in the annex not a far walk from the main guesthouse building. Previous guests raved about the kindness of the staff, who were very helpful in discovering the nearby area, and the unparalleled quiet and beautiful scenery. Check out Gjaargardur Guesthouse’s photos, reviews, prices, and availability here. One of my favorite islands in the Faroes, I don’t know why more travelers don’t visit Suðuroy! 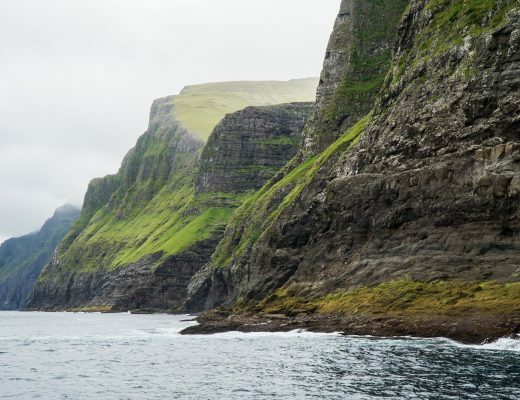 I suppose the two-hour long ferry scares them off, when all the other islands are more easily accessible, but still: I’ll argue over and over again that Suduroy is well worth a visit when you come to the Faroe Islands. There are a few main towns on Suduroy: Tvøroyri, where the ferries let you off, Hvalba, my personal favorite town, and Vágur, the largest town on the island. I’ve only found Suduroy accommodations in Tvøroyri listed, so you’ll find my top pick below. Where I stayed in Tvøroyri, I loved my stay at B&B Suduroy hosted by Bindi! This small B&B is incredibly cozy and we could have easily stayed here for days enjoying Suduroy. It has two bedrooms, each with two beds, so it’s great for a larger group of travelers, or you can rent out just one of the rooms and be willing to share the bathroom and kitchen with other travelers. There’s a kitchen in the guesthouse with a gorgeous view of the fjord, and you’re brought a basket full of local goodies to make yourself breakfast each morning: a great idea that I wish more guesthouses did! The whole place is very new and modern, and I really loved the décor – it had that cozy feel that made you feel instantly at home, with plenty of cozy textiles and comfortable sitting areas. I especially loved the ultra-modern bathroom and kitchen, both of which made me feel like it was a shame we only stayed the one night! Have you stayed anywhere in the Faroe Islands? Where do you recommend?